This week the Chinese Communist Party (CCP) hosts the gala of the 19th Party Congress, a once-in-five-years show of “democratic centralism” that, in theory at least, should see the “election” of the Party’s Central Committee, its Politburo, and, the holy of holies, the Politburo Standing Committee. Everyone knows, of course, that the results are preordained: the Congress will merely rubberstamp the arrangements worked out by the CCP leadership, reflecting the current state of clandestine dog-eat-doggery at the top of the Chinese political Olympus. In this sense, the Congress is well within the historical tradition. Nineteen Party Congresses make for an awfully long timeline. Founded in 1921 (which was also when the first Congress was held), the CCP is now 96 years old, a little older even than the Soviet Communist Party at the time of the Soviet collapse. The Chinese propaganda machine has a special word to describe the party’s history: “glorious.” But “tortuous” would be a more fitting adjective. Each Party Congress is like a milestone on a long, winding road of 10,000 li. Some parts of the road are better than others. As Xi Jinping’s limousine rolls forward through the better-paved section, past congresses are a humbling reminder of the roads taken, the roads not taken, and the tragic toll paid. All congresses were important but some clearly stand out. The first, now firmly entrenched in the CCP mythology as the moment of creation, was held in the French concession in Shanghai. It was attended by a mere 13 delegates, representing the nation-wide membership of 53. In the middle of the First Congress, the hapless participants had to move the venue due to fears of arrest. The discussion continued in the nearby town of Jiaxing, on a boat in the middle of a lake. The momentous first gathering attracted two agents of the Soviet-sponsored Communist International (Comintern), one a Dutchman called Henk Sneevliet (codename: Maring), the other a Russian called Vladimir Neiman (codename: Nikol’skii). The Comintern’s presence indicated that the Chinese Communist Party was conceived as a constituent part of the global Communist movement centered in Moscow. The Party’s founding fathers — among them Great Helmsman in the making Mao Zedong — not only deferred to Soviet instructions but, in some instances, took Soviet money. Between 1921 and 1927 the Chinese Communists held congresses nearly every year – five of them in all. The Party accepted tens of thousands of new members, even though China was an agricultural country, and so utterly unsuitable for Communism from the classical Marxist perspective. But, then, the Russian Bolsheviks had come to power in 1917, although theirs, too, was a far cry from the kind of industrialized country that Marx and Engels deemed ripe for revolution. The CCP’s luck did not last. In 1927, Chiang Kai-shek, who had risen to the leadership of the much more powerful Nationalist Party (Guomindang), unleashed a bloody purge of the Communists. Thousands were killed. The party was nearly exterminated. In 1928, a decimated CCP held its sixth congress in a little village near Moscow, the only time a Congress took place outside China. There would not be another for nearly two decades. In the meantime, hounded in the cities, the Communists flocked to the countryside. In November 1931, the CCP organized their first “Soviet” in the mountainous Jiangxi province. Pressed on all sides by the Guomindang, the besieged Communists struggled on for a few years but in October 1934 decided to break out of their encirclement. So began the Long March – the CCP’s circuitous journey through some of the country’s most desolate places to a new base area in Yan’an, China’s northwest. The Long March was important politically, for it witnessed Mao Zedong’s rise to the forefront of the party leadership. The CCP’s Yan’an years overlapped with the much larger drama of the Sino-Japanese war, in which the Communists, barring a few exceptions, played an insignificant part. Mao profitably spent these years consolidating his control over the party. He did it through a brutal “rectification” campaign, honing tactics of terror and intimidation that he would deploy time and again in later years. Mao’s potential rivals in leadership like Wang Ming (who claimed Moscow’s support) were cowed into submission. The “rectified” Party held its seventh Congress in 1945 (after an interval of 17 years). It was the first congress that declared something called “Mao Zedong Thought” to be the guiding principle of the CCP, effectively formalizing the worship of Mao. 1945 also marked the end of the Sino-Japanese War. The fragile peace between the CCP and the Guomindang, which held for the duration of the conflict with Japan, gave way to a civil war. Four years later, triumphant Mao, standing atop the Gate of Heavenly Peace in Beijing, proclaimed the establishment of the People’s Republic of China. Defeated, Chiang Kai-shek fled to Taiwan. The CCP held its eighth and first post-Civil War Congress in September 1956. It was in many ways a curious affair. Earlier that year the Soviet leader Nikita Khrushchev had denounced his predecessor Stalin from the platform of the 20th Congress of the Soviet Communist Party. China, then still the USSR’s younger brother, was expected to follow suit and combat the “cult of personality,” exemplified by Stalin. But, then, Mao was Stalin’s kindred spirit; would he really agree to tone down his own personality cult? For a time, it seemed that he would. The reference to Mao Zedong Thought was deleted from the Party Constitution, and Mao devolved some of his authority to other top leaders. One of them, Liu Shaoqi, was soon appointed China’s “chairman,” a rival of a kind to Mao who was also chairman, but of the Chinese Communist Party. If pundits were asked to speculate about the direction of Chinese politics after the Eighth Congress, many would have likely predicted Mao’s gradual political decline, perhaps even early retirement. Nothing of the kind happened. And here is a major takeaway from the CCP’s history: Party Congresses may be historical milestones but they are certainly not directional signs for predicting the future. Indeed, instead of settling into Soviet-style bureaucratized routine, the Party was thrown into a decade of chaos after the Eighth Congress. The turning point was 1957. Mao, inspired by the launch of the Soviet Sputnik, an artificial satellite, proclaimed that the East Wind was already prevailing over the West Wind. The forces of capitalism were retreating. Socialism was triumphant everywhere. Absent a satellite of his own, Mao decided to launch a political “Sputnik” – the Great Leap Forward. The hare-brained campaign was supposed to see China leapfrog its way to industrial prowess. Millions of people were herded to dig canals and reservoirs, and to build backyard furnaces to produce steel — even in places that had neither iron ore nor coal, never mind the technical expertise. In a bid to impress Mao, local party officials boasted of absurd harvest yields, while food was distributed freely in the public kitchens of hastily created utopian communes. The Great Leap backfired spectacularly. Within months, millions were starving. By 1961 tens of millions had died in the worst famine in human history. Mao believed that the failure of the Great Leap was a result of the lack of faith within the party. Its ranks, he reasoned, had succumbed to red tape and corruption. In 1966 he unleashed the Cultural Revolution to rid the party of these poisonous tendencies. The country was plunged into chaos as the Party and the government came under concerted attack of youthful Red Guards who, brandishing Mao badges and their “little red books” of Mao quotations, terrorized, humiliated, and murdered the politically suspect. The Cultural Revolution saw the rise of Lin Biao, the military commander, and now Mao’s worshipper-in-chief. Concerned about the chaos that he himself had created, and also about the military threat posed by China’s former ally the Soviet Union, Mao allowed the military to take the leading role in governing China. In 1969, at the Ninth Congress of the CCP, the Central Committee was packed full of military officers, and Lin himself was officially proclaimed Mao’s heir-apparent. The rapacious machine of the Cultural Revolution ground to an uneasy halt. “Mao Zedong Thought,” meanwhile, was reintroduced into the party constitution, and remained there ever since. But, once again, the milestone proved to be no directional sign. In 1971 Lin Biao fled China after a botched coup d’etat. Lin’s plane crashed in Mongolia, killing all those aboard, including Lin, his wife and his son, the mastermind of the coup. Eventually the Soviet KGB sent experts to check on the bodies; they took away some of the heads for analysis in Moscow. But the bodies are still buried in the Mongolian grassland, a poignant reminder of a power transition gone terribly wrong. Compared to the first nine party congresses, the latter ten were a song. They were now held at five year intervals, an indication of normality in party politics. As before, however, the calendar of key political developments did not necessarily coincide with the rubberstamp gatherings. The most important events of the 1970s, including the arrest of Mao’s wife Jiang Qing, Deng Xiaoping’s rise to power, and the turn towards “reform and opening,” all occurred between congresses. In the 1980s, as China set out on the path to economic reform, Deng Xiaoping used party congresses for an important political aim: to rejuvenate the Party leadership. The most important congress in this respect was the 13th Congress, held in 1987. Deng eased out the Party stalwarts who, he feared, would obstruct his reform agenda. He also relinquished his official positions in favor of younger proteges, including Zhao Ziyang, China’s Gorbachev. Yet despite the title changes, Deng and other Party elders still lurked in the political shadows, watching, controlling. The extent of their influence became clear in June 1989, when Deng intervened brutally to suppress the student demonstrations in Beijing’s Tiananmen Square. Zhao Ziyang, who had supported dialogue with students, was sidelined and later placed under house arrest. Still, the succession procedure instituted by Deng Xiaoping, proved to be a stroke of political genius. Leaders got ten years at the helm before surrendering the reins of power to well-groomed successors. The idea was to avoid the repetition of the tragedies of the Mao era, when the supreme leader, unobstructed by any formal or informal checks and balances, ossified in proud solitude, while the country succumbed to fatal whims of his inflamed imagination. The practice outlived Deng, who died in 1997. Zhao Ziyang’s replacement, Jiang Zemin, gave way to Hu Jintao, who gave way to Xi Jinping. The system seemingly enjoyed a degree of stability. Of course, this is an illusion. The Party edifice rests on the uneasy coexistence of rival factions with distinct political and economic interests. Xi disturbed this balance when, following his ascent at the 18th Party Congress, he rapidly moved to consolidate his personal power by means not unlike Mao’s infamous rectification campaign in Yan’an. The tragedy of China’s political system is that, in the end, there is nothing to bar the repetition of the Party’s most egregious mistakes. 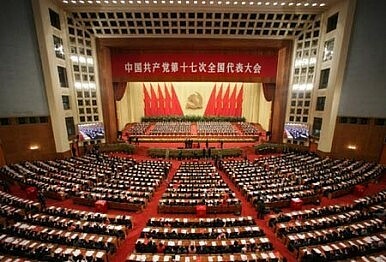 The 19th Congress sees Xi in mid-act, and much ink will be devoted to analyzing the results of this week-long meeting. Yet as history teaches us, congresses are milestones, not directional signs. Let us hope that China’s leaders avoid returning to the more disastrous roads walked by their predecessors. Sergey Radchenko is Professor of International Politics at Cardiff University. Follow him on Twitter: @DrRadchenko.